Thanksgiving brought plates piled high with turkey and stuffing, mashed potatoes dripping with gravy, brussels sprouts, carrots, squash, and peas Later that night, finally hungry again, our families gathered together in the kitchen for turkey sandwiches spread with mayo and cranberry. Friday night was leftovers, straight out of the tupperware. Saturday we transformed them into Turkey Tetrazzini or Divan. 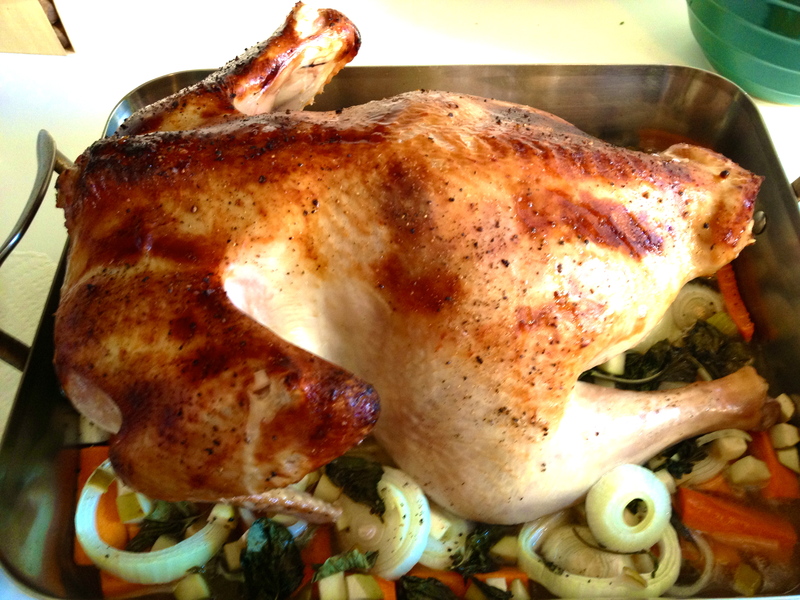 Now, picked clean, the turkey carcass is ready for soup: thin, disappointing turkey soup. If we’re lucky, there is a little gravy left over to thicken it. But it doesn’t have to be that way. I found this recipe in the Gourmet cookbook, and now use it every year. This is by far the richest turkey carcass stock I have ever tasted. One more thing to be truly thankful for this holiday. Pick the big pieces of meat from your turkey carcass or carcasses, retaining about 2 cups of meat. Break up the carcass with your hands and place it, along with any remaining skin and the wings, in a stock pot. Cover with water so the bones are 2-3 inches under the surface. Bring to a simmer and skim the foam from the surface. Chop and add 2 celery ribs, 1 large carrot and 1 large onion along with 2 bay leaves. Simmer for four hours, then remove from heat and let cool to room temperature. Chill the stock in the fridge overnight. In the morning, skim the fat from the surface of the stock. The stock below will be like jello. Warm over medium heat, until the stock is liquid, then strain through a colander and discard the solids.Strain one more time through a fine strainer lined with cheese cloth. This is the stock for your soup. In a soup pot, saute onion, carrot and celery in butter over medium heat until lightly browned on edges. Add bay leaves, stock and turkey. Simmer over low heat for 25-30 minutes to develop flavors. Add grains or pasta, simmer 5 minutes more, season to taste with salt and pepper, and serve – all week long. Lean in close, I have a confession to make. Up until one week ago I didn’t care much for mashed potatoes. Really, I could take them or leave them. I’ve tried to fall in love with the prize of dinner tables across America. They just didn’t get me excited. Until last week. It was my pre-Thanksgiving demo at Eastern Market. Marvin at Long Meadow had beautiful Russets and it seemed a shame not to serve them up light, fluffy, creamy and rich. I sat down and did some reading. The recipe, it turns out, is simple and perfect. 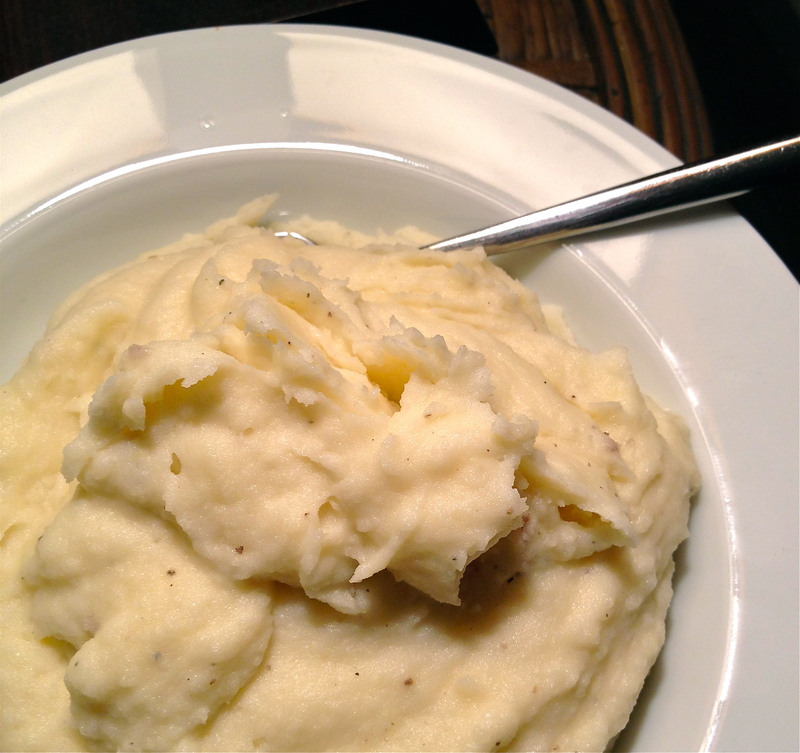 What’s the secret to the world’s best mashed potatoes? Three things. Use a good starchy potato. Yukon Golds are okay, but Russets are the best. Several people have praised Kennebecks as well. I’d love to try them. Pass the potatoes through a ricer or food mill*. The less you work them the fluffier they are. Beaters just make them gummy. Crème fraîche. The one thing lacking amidst the comforting starchy potatoes, rich cream and butter, salt and pepper, was a little bite. Something to keep your palate from being lulled to sleep. Sour cream is too sharp. Crème fraîche is the perfect answer. So this year I will finally join those of you who have been extolling their virtues and raise a glass – and a large sauceboat filled with gravy – to a bowl filled with fluffy, rich mashed potatoes. Happy Thanksgiving! *Bonus! The food mill will catch the skins. No more potato peeling. Don’t worry, you can find another job for cousin Johnny! Boil whole and unpeeled potatoes until a paring knife easily pierces to the center, but potatoes are not falling apart. Using the finest disc, press potatoes – peels and all – through a food mill into a medium bowl. The food mill will catch the peels. Stir butter, cream and crème fraîche into warm potatoes. 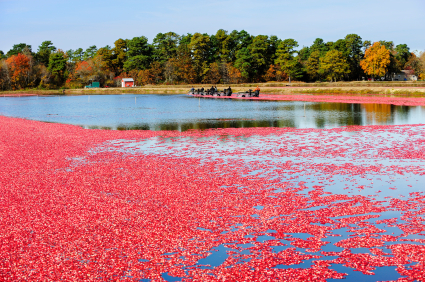 Cranberries provide an island in that storm: tart, black-red and jammy. That is, unless you plop the cloying, wobbly log of jello out of the can. While my brother requires its presence on our Thanksgiving table, I instead look to whole cranberry compote, fresh, minced cranberry salad, or even a savory cranberry mold to deliver much needed relief. Cranberries see the world in black and white: all acidity and no sugar. So even the tartest cranberry dish needs sweet balance. 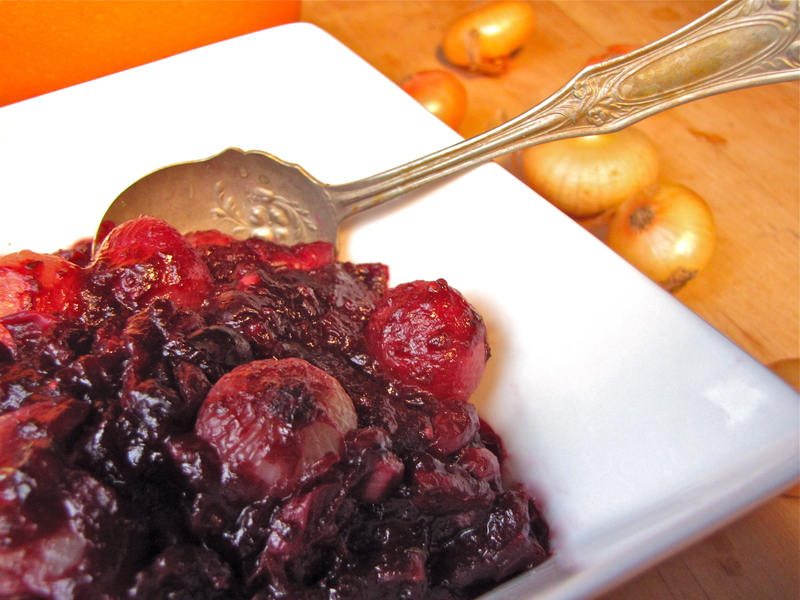 This compote delivers it with Cippolini onions, glazed with maple sugar, butter and rich stock. The cranberries cook down in port wine to a thick, jammy texture. One spoonful per dinner guest will satisfy. But make a double batch. Blended with a little mayo, it will transform the sandwiches you’ll inevitable be sharing around the kitchen table later that night. Melt butter over medium heat in a 3 qt saucepan. Add onions and cook for 3-4 minutes, until golden brown in places. Add cranberries, port, and cider. Simmer over low heat until liquid is reduced to a glaze and cranberries have turned jammy. The cranberries will pop delightfully as they cook. but don’t worry, the juices don’t spatter out of the pot. The first year I served Christmas dinner, I began with a celery consommé. It delighted my Mom, who felt it was the perfect start to a heavy holiday meal. It was light and clean, and the distilled herbal, grassy taste of celery woke up your tastebuds ahead of the numbing succession of starches and winter vegetables. This soup is very much like that – except for the thick, smooth, creamy, buttery part. Oh, and the bacon. It does, however, share a freshness bestowed by the mild, delicate flavor of the celery root, that balances the comforting texture. 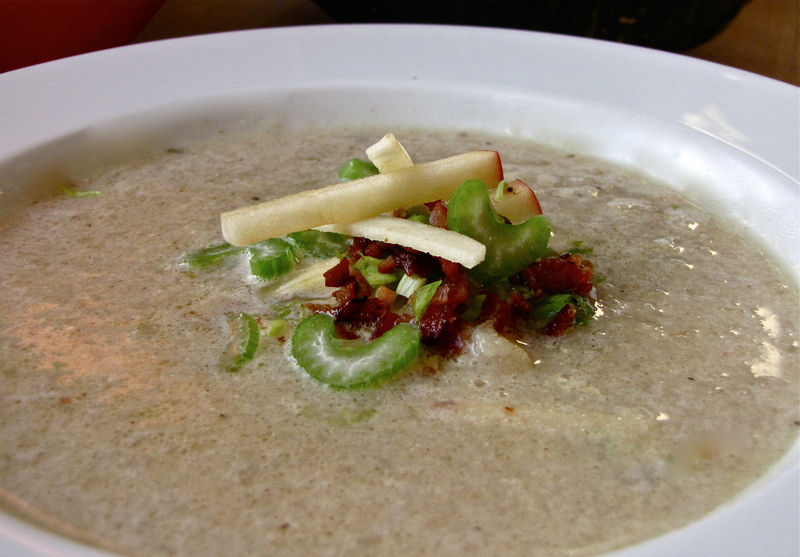 It is also a perfect example of garniture: crisp, bright flavors balancing – without overpowering – the soup. As you can see, it is beautiful enough for a special occasion, but simple and hearty enough for a weeknight meal. Fresh harvested celery root, or Celeriac, stores well too, so this soup will take you right through the winter months. In 4 qt stock pot, cook bacon, rendering fat and browning. Remove bacon with slotted spoon. Sauté shallots in bacon fat over medium heat until soft. Add celery root and cook additional 3-5 minutes. Add garlic and cook 1 minute until fragrant. Add stock to pan and simmer for 20 minutes until celery root is soft. Process soup with an immersion blender or food processor until smooth. Return to pot and warm to a simmer. Remove the soup from heat and stir in the cream and butter. Season to taste with salt, white pepper and vinegar. Serve garnished with apple, celery, celery leaves and bacon. A few weeks back I came home from my cooking demo at Eastern Market with some extra cauliflower. It was already prepped and seemed like a horrible waste not to use it. Looking at the Yukon Golds I had diced to thicken a soup, I started thinking about potato pancakes. Potato pancakes are the ultimate leftover. Out of the fridge come desiccated mash potatoes, crumbly and bland. Add an egg et voilà! you have a creamy, crispy cake of goodness – even more satisfying than Mom’s Turkey Divan, which reliably appeared on the table two days after every Thanksgiving and Christmas. Inspired to attempt cauliflower cakes, I steamed the leftover cauliflower and braised the potatoes. I added Porcinis for depth of flavor, Pecorino Romano for bite and Panko breadcrumbs to firm up the wet mixture. They came out rich and creamy: the texture of fish cakes with a crisp, caramelized crust. Cover mushrooms with 2 cups boiling water. After 20 min, strain, squeezing liquid from mushrooms. Reserve liquid and strain it through cheese cloth. Chop mushrooms finely. Over medium heat, sauté onions in 2 tbs olive oil for 3-5 minutes. Add potatoes, sauté 5 min more. Add porcini liquid and thyme then cover. Cook until potatoes are soft and pan is almost dry. Add water during cooking if needed. Sauté cakes in olive oil over med-low heat. The lower heat allows them to dry out a bit. 2tbs cakes are perfect for hors d’oeuvres. 1/4 – 1/3 cup cakes are the right size for a side dish. 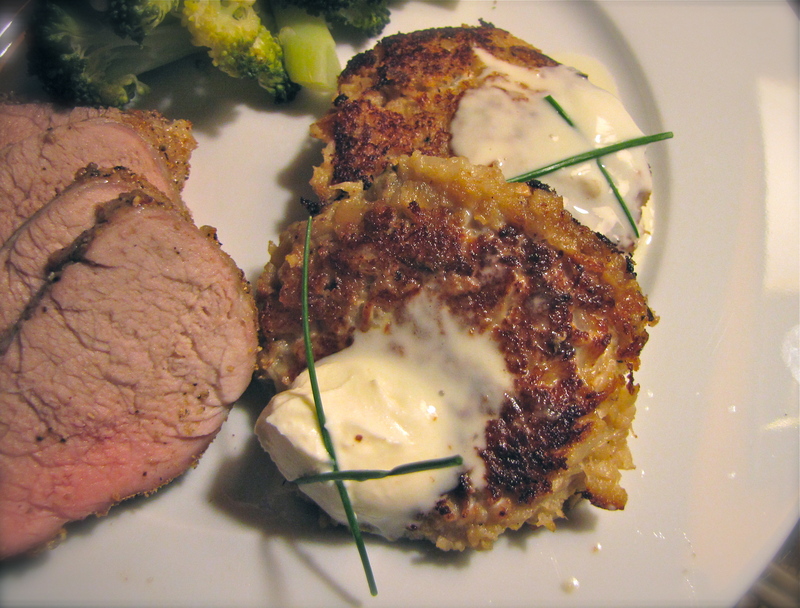 Serve topped with crème fraîche and chives. *When checking the flavor of a mixture like these cakes, which contains raw eggs, simply cook one small cake and taste it. This trick also works well for meatloaf and hamburgers. I took over Christmas dinner from my Mom in 1996. She is one of seven children, and every year Mom prepared two back-to-back meals: one for our immediate family of five on the 25th, and another for our extended family of 35 on the 26th. I asked her if the holidays might be more fun with one less meal to cook. Christmas dinner has been my annual gift to our family ever since. That very first year I cracked open a copy of Sarah Leah Chase’s Cold Weather Cooking that had been passed down to me by Kathy Bugbee, the mother of my best friend from college. I cooked my way through nine different recipes, including her brussels sprouts and chestnuts in a maple glaze. My family loved it and it is the one recipe that continues to make an appearance every single year (although the others reappear often) and now shows up at Thanksgiving as well. I haven’t looked at the recipe in almost a decade, but this is probably pretty close to the original. Thank you Sarah; and Mom, kick back and enjoy the day. It is the least I can do for everything you do for me. Steam brussels sprouts until crisp tender. Remove to a bowl of ice water to stop cooking. When cool enough to handle, cut each in quarters. Make sure part of the core remains with each quarter so that leaves do not separate. Simmer roasted and peeled chestnuts in stock for 15-20 minutes to soften. Remove and reserve stock for the sauté. Sauté bacon over medium heat until lightly browned. Remove to paper towels. Sauté sprouts in bacon fat until tender. Add chestnuts and warm through, 2-3 minutes. Add maple syrup and fresh herbs with a 1/4 cup of stock. Cook until liquid reduces to a glaze. Season to taste with salt, pepper, nutmeg and cardamom. Chestnuts can be cooked in four ways: microwaving, roasting or boiling. The first two begin with scoring an “x” in the shell on the flat side of the nut. Microwave: Place the scored chestnuts on a paper plate and microwave them for 2 minutes on high. Cook for an additional 20-30 seconds at a time until done. They are done when the shell peels back at the X and the shells and skins peel easily. Roasting: Place scored nuts in a 350 degree over for about 30 minutes. They are ready when shells peel back and can be easily shelled and skinned. Peel as soon as they are cool enough to handle. Warm nuts will be easier to peel. Boiling: Soak chestnuts overnight. The next day, boil them for an hour to an hour and a half. Remove a few at a time from the water and peel while warm. Somebody else: The easiest way to get the job done is to buy the chestnuts cooked and peeled in a foil bag or jar. You don’t get the same rich, roasted flavor, but they’ll do in a pinch. It’s not about the money. Part II. I wanted super mushroom soup. Mushroomy soup that tasted like mushrooms. Deep rich and delicious, not dull and salty, overpowered by cream and thickeners. I know that much flavor would need to start with a strong stock. Once I had that base I needed more mushrooms. I sautéed the Oyster and Shitake caps whose stems had flavored the stock. A half hour later, I strained the soup again. Now it was rich and mushroomy, beautifully dark brown and clear. But I wanted more! I sliced Crimini mushroom caps thinly and sautéed them in farm-fresh butter. Deglazing the pan with Madeira added richness. This was it! Three layers of mushrooms and I was finally satisfied. This is was the mushroom flavor I had been looking for! 4 cups chopped wild mushrooms. I used Shitake and Oyster. Heat 2 tbs oil in 4 qt saucepan over medium. Add 4 cups wild mushrooms and sauté until lightly brown. Add thyme and mushroom stock. Simmer for 20-30 minutes. Meanwhile…melt butter in a sauté pan over medium heat. Cook 2 cups sliced mushrooms until lightly browned and pan is dry. Stir in thyme. Season to taste with salt, pepper and nutmeg. Return mushroom broth to 4 qt saucepan. Add sautéed mushrooms and cook for an additional 10 minutes. 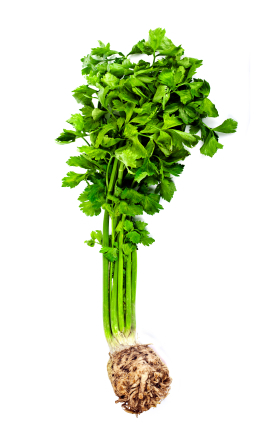 Season to taste and serve soup garnished with parsley. A tablespoon of butter stirred through will make it nice and rich. 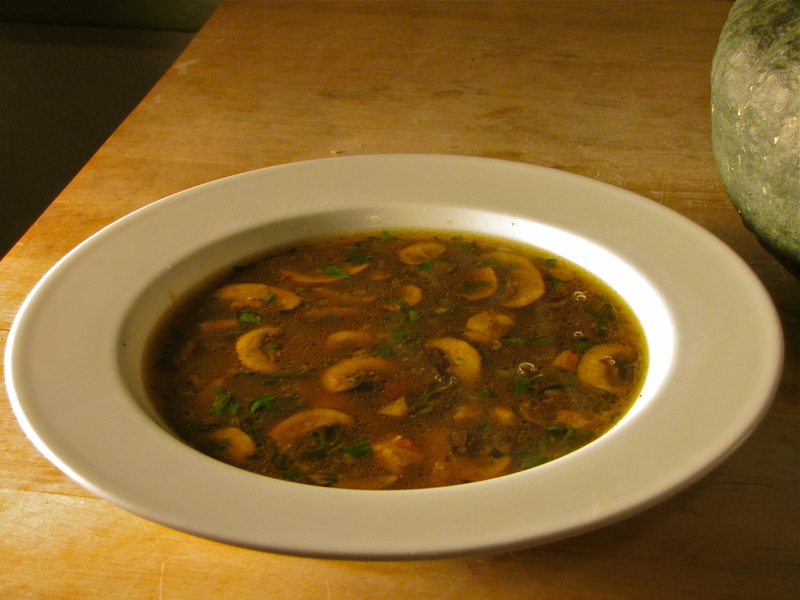 *If you want a thicker soup you can purée the mushrooms into the soup at this point and continue as below. Add a 1/4 cup cream before serving. Or add the mushrooms to braining liquid or Sunday morning’s omelet.